Morning, friends! I seem to be sharing a video a day these days. Hoping I am not overwhelming you, I have a few trips planned for the rest of the month (going to a teaching event on the 21st and than to Poland for a few days with family to do some sightseeing), so I will probably be sharing less projects during that time. Anyhow, today I’d like to talk about easy ways one can color outline images. I used to be afraid to do coloring, I didn’t know where to start so I avoided outline images for a loooooong time. I’m sure there are others like me out there. Thankfully, there are many different ways to color images and some do not require you to have any skills or special supplies. One of those ways is by using ink from your ink pads! 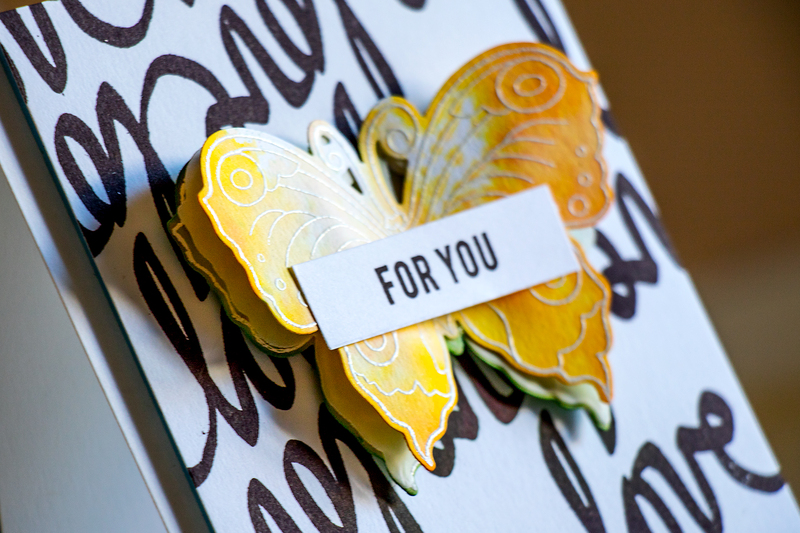 So this is exactly what I did to color the butterflies on he cards I’m sharing today. I used 3 colors (or 3 shades of one color) of ink, added those to a clear block, spritzed some water to dilute the ink and help it flow and placed a stamped and die cut butterfly on top. Super easy, fun and addictive! If you’d like to see the entire process in detail please watch my video below or on my Youtube channel, I’m also sharing the same project on Altenew blog today. I used two stamp sets from Altenew to create these cards – Super Script 2 and Bejeweled. 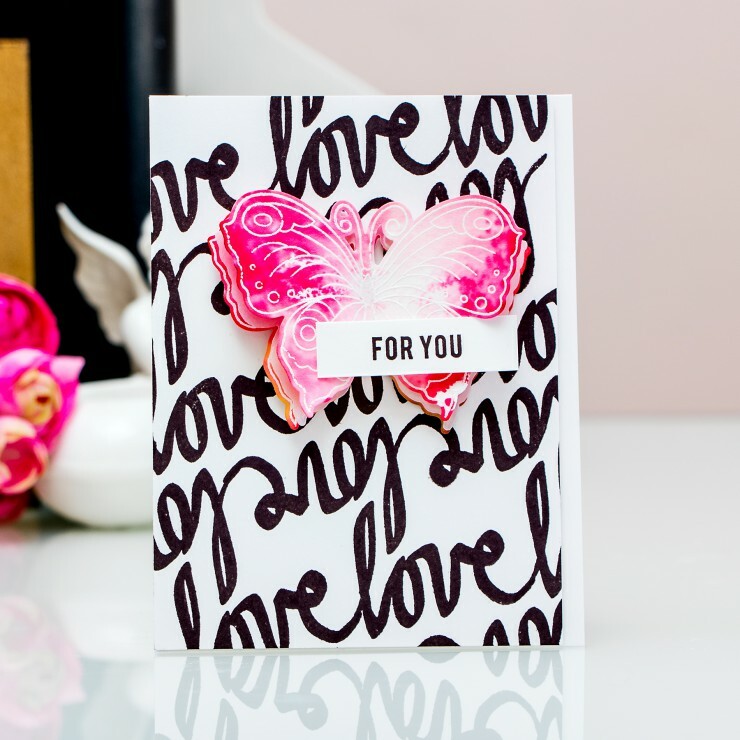 The Love stamp from the Super Script 2 was used to create a bold diagonal background using black ink; and a few butterflies were heat embossed in white embossing powder using stamps from the Bejeweled set. My butterflies ended up being very dimensional. I layered 3 for each – one nicely colored on top, one die cut out of vellum and one more colored butterfly on the bottom. I didn’t want to throw anything away so I used those that I didn’t like the coloring on to create a dimensional embellishment. I think it turned out okay. Do you like to color? What is your favorite way to add color to outline images? Are you a pencil/marker/paint kind of person? These are just Beautiful, Yana! I love the background stamping as much as the butterflies. I started out water coloring my stamped images with Marvy markers scribbled onto an acrylic block, then SU re-inkers (which I love) then crayola washable markers too, got some Bic mark its to see if my hands would do marker coloring for a year or more and just invested in my first copics last summer, tried real water colors a few months ago. I love them all and especially my copics. I’ve alredy drained several sketch markers and need refills! Beautiful cards. I had never thought to do a bold background with word stamps. Thank you so much. I’m now a subscriber. Brilliant! 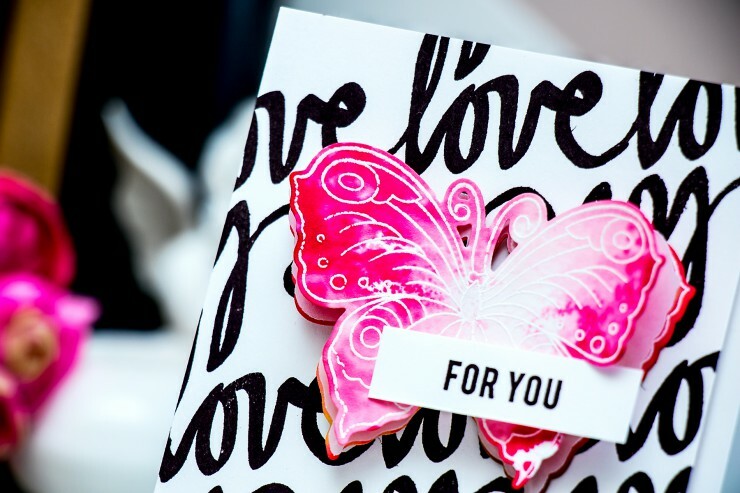 The black/white graphic background really sets off the focal butterflies. You’re “painting” technique looks fun, too. I Enjoyed your video. Thank you for sharing. I’m off to look at older posts because I know I’ll find more treasures on your blog.